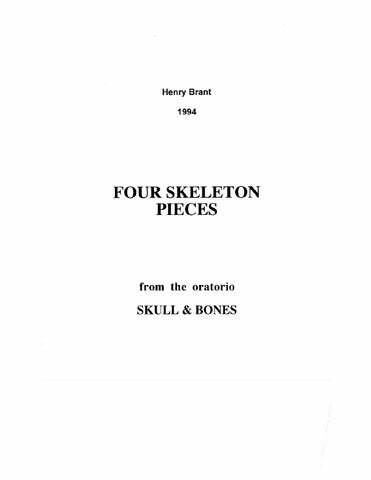 Henry Brant is America’s foremost composer of acoustic spatial music. 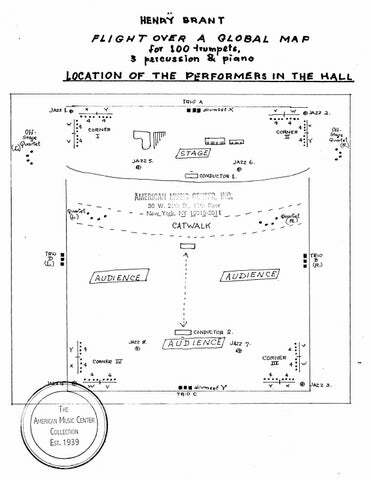 The planned positioning of performers throughout the hall, as well as on stage, is an essential factor in his composing scheme and a point of departure for a radically expanded range and intensity of musical expression. 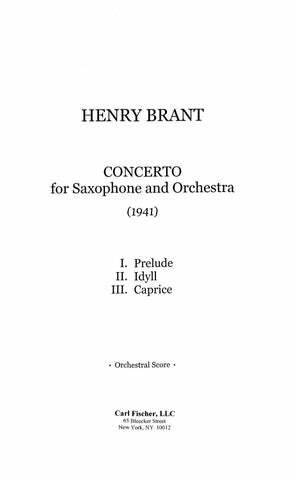 Brant’s mastery of spatial composing technique enables him to write textures of unprecedented polyphonic and/or polystylistic complexity, while providing maximum resonance in the hall and increased clarity of musical detail for the listener. Brant’s principal works since 1950 are all spatial. His catalogue now comprises over 100 such works, each for a different instrumentation and requiring a different spatial deployment in the hall. 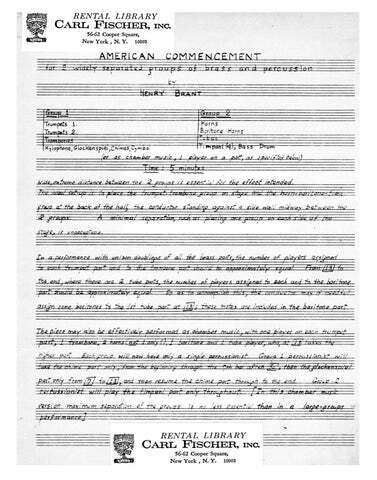 In the mid 1950s Brant felt that “single-style music…could no longer evoke the new stresses, layered insanities, and multi-directional assaults of contemporary life on the spirit” In keeping with Brant’s belief that music can be as complex and contradictory as everyday life, his larger works often employ multiple, contrasting performing forces, as in Meteor Farm (1982) for symphony orchestra, large jazz band, two choruses, West African drum ensemble and chorus, South Indian soloists, large Gamelan ensemble, percussion orchestra and two Western-style solo sopranos. 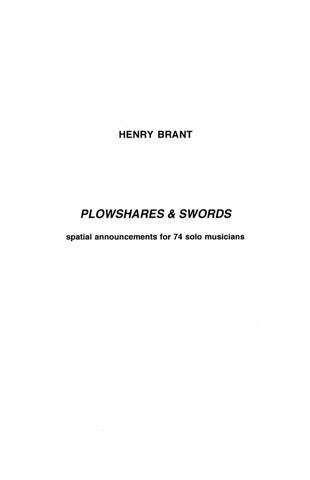 Brant’s spatial experiments have convinced him that space exerts specific influences on harmony, polyphony, texture and timbre. He regards space as music’s “fourth dimension” (after pitch, time and timbre). 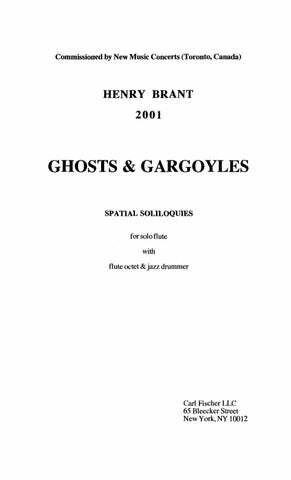 Brant continues to experiment with new combinations of acoustic timbres, even creating entire works for instrumental family groups of a single timbre: Orbits for 80 trombones, Ghosts & Gargoyles for 9 flutes, and others for multiple trumpets, flutes and guitars. This predilection for ensembles of a single tone quality dates from Angels and Devils (1932). Brant does not use electronic materials or permit amplification in his music. 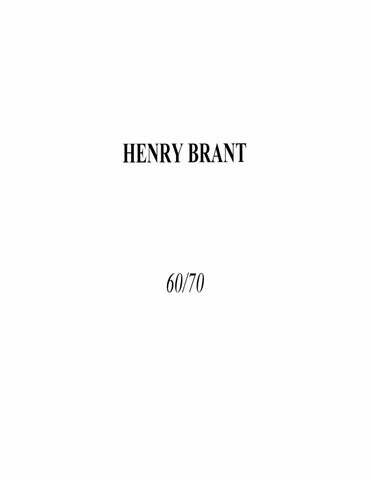 A member of the American Academy of Arts & Letters, Brant was awarded the 2002 Pulitzer Prize in Music for Ice Field (2001). He has received two Guggenheim Fellowships and was the first American composer to win the Prix Italia. Among other honors are Ford Foundation and Fromm Foundation grants, Koussevitsky and National Endowment for the Arts awards, and the American Music Center’s Letter of Distinction. 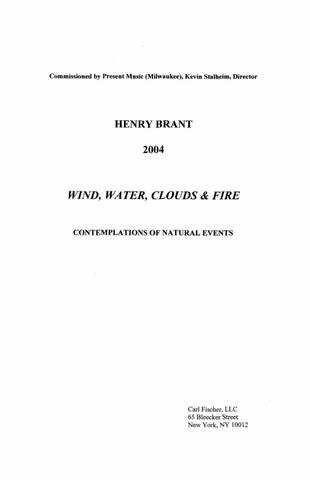 Brant’s work has found municipal recognition in an official Henry Brant Week in Boston (1982), in a series of ten all-Brant concerts at the Holland Festival in Amsterdam (1984), and in New York City’s Certificate of Appreciation (1992). The Paul Sacher Foundation in Basel has acquired the complete archive of Brant’s original manuscripts (1998). In conjunction with Brant’s 85th birthday concert, Wesleyan University conferred upon him the honorary degree of Doctor of Fine Arts (1998). 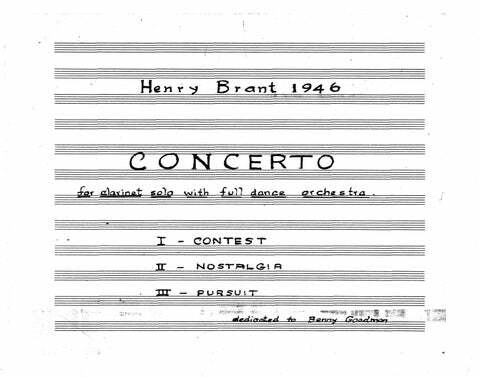 Born in Montreal of American parents in 1913, Henry Brant began composing at the age of eight. 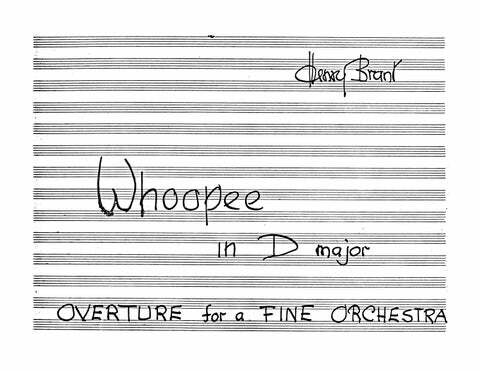 After moving to New York in 1929, he composed and conducted for radio, films, ballet, and jazz groups. Starting in the late 40s, he taught at Columbia University, Juilliard, and, for 24 years, Bennington College. In 1981, he settled in Santa Barbara, California, where he died at home, on April 26, 2008, at the age of 94. 5:00 3 3 3 2 – 2 3 2 0; Timp. Perc. Pno. Hp. Str. 6:00 2 1 2 2 – 2 2 1 0; Perc. Pno. Str. 7:00 3 2 2 2 – 4 3 3 1; Timp. Perc. Str. 7:00 2 2 2 2 – 4 3 3 1; Timp. Perc. Str. 6:00 1 1 2 1 – 2 2 1 0; Timp. Perc. Pno. Str. Or Fl.(dbl. Picc.) Cl. Pno. 3Vln. Vla. Vcl. Cb. (The Nineteen Thirties) 21:00 3 3 3 3 – 4 3 3 1; Timp. 3Perc. Str. (Promised Land) 21:00 2 2 2 2 – 4 2 3 1; Timp. 2Perc. Str. 12:00 3 3 3 2 – 4 3 3 1; Timp. Perc. Hp. Str. 5:00 1 1 2 1 – 2 2 1 0; Perc. Pno. Str. 12:00 Optional men/women chorus (or high/low); 3 3 3 0 – 4(or 5) 3 3 0; Timp. Perc. Str. 15:00 1 2 1 2 – 1 1 1 0; Timp. Pno. Hp. Str. 12:00 3 3 4 3 – 5 3 3 1; Timp. Perc. Pno.(opt.) Cel. Hp. Str. 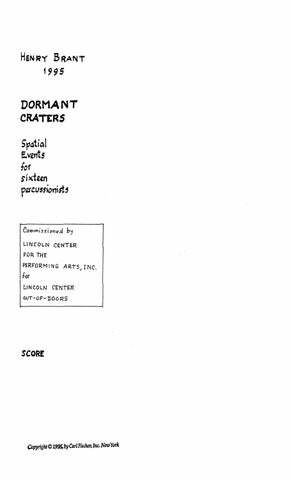 (Spatial narratives for large and small orchestral groups) 21:00 3 picc. (3)/3/3/3; 4-6/3/3/1; Timp. perc. (4), pnos. (2), org.(improv. ), hp. (2); str. 23:00 Orchestra I: 1 3 1 3 – 0 0 3 1; Timp. 2Perc. Pno. Hp. Str. ; Orchestra II: 2 0 4 0 – 0 0 0 1; Timp. 2Perc. Pno. Hp. Str. ; Brass I: 4Hn. 2Tpt. ; Brass II: 4Hn. 2Tpt. 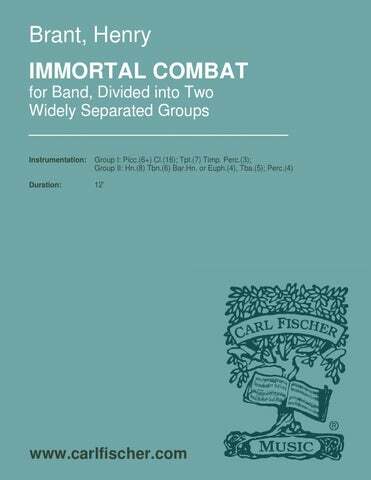 11:00 3 orchestra groups (3 conductors) 3picc./3/3/3 – 4 3 3 1; Timp. 3Perc. pno. (4 hands), 2Hp. str. 12:00 Solo Cl. ; 2 1 2 2 – 2 2 1 0; Timp. Perc. Pno. Str. 20:00 Solo Eb Alto Sax; 2 2 2 2 – 0 3 2 0; Perc. Pno. Str. (Concerto for Violin and Orchestra) 15:00 Solo Vln. ; 3 3 3 2 – 2 3 2 0; Timp. Perc. Pno. Hp. Str. 2:00 Solo violin (or viola); str. 13:00 Solo soprano (2), alto (2) voices; str. orch. 9:00 picc., cl. (2); tpt., hn. (2), tbn., tba. ; timp. perc. (3 Places in Montreal) 8:00 cl. (2), a.sax., t.sax. (2) (b.cl. ), b.sax. ; tpt. (2), tbn. (2), tba. ; perc. 22:00 Solo alto saxophone (or trumpet); fl., cl. (4), a.cl. (or b.cl. ), b.cl. ; tba. ; perc. 12:00 Solo clarinet; a.sax. (2), t.sax. (2), b.sax.(b.cl.) (all saxes, dbl. cl. ); tpt. (4), tbn. (2); cb., drum set, pno., gtr. ; vibr. 6:00 Solo clarinet; a.sax. (2), t.sax. (2), b.sax. (all saxes dbl. cl. ); hn., tpt. (4), tbn. (2); gtr., pno., cb., drum set, perc. 10:00 Solo clarinet; chimes, pno. ; sop. vln., vln, vla., ten. vcl. 5:00 Solo Picc. ; E.H. Bsn. A.Sax. Hn. Vcl. Cb. (Words over Fireworks) 6:00 Solo female speaker; picc., Eb cl., bsn. ; Timp. chimes, hpschd., pno. ; vln., vla. full score, picc., vlc., pno. full score, pno., perc. (kitchen hardware); or Eb cl. ; perc., pno. ; or vln. ; perc., pno. 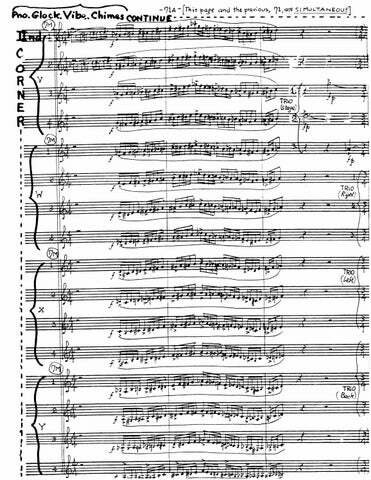 full score, vln., vla., ten. vln., vlc. full score, fl. (picc. ), vln., vlc., accordian, pno. 5:00 picc., cl. ; hn. (2), tpt., tbn. ; glsp., timp. full score, ob., cl., bsn., hn. (Triple Concerto for 3 Bassoons) 18:00 3 solo bassoons; 2 2 2 0 – 4 2 2 1; Timp. Perc. Pno. Hp. Str. 16:00 Solo coloratura soprano voice; 2 light projection keyboards (opt. ); 1 1 1 1, A.Sax.(dbl. B.Sax) – 1 1 1 0; Perc. ; 2Vln. Vla. 2Vcl. Cb. 18:00 Solo baritone (or bass) voice; Babone (tbn. with bsn. bocal reed) or sax. ; steel drums; picc. (3)/2-3/2-3/2-3; 4/4/3/1; Timp. perc. (3-4); str. 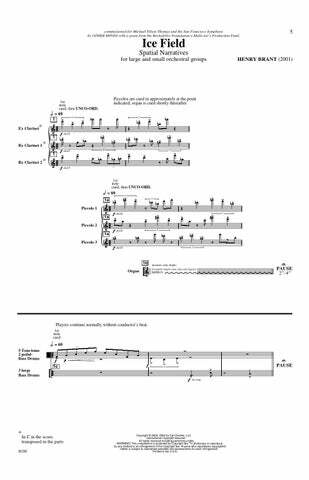 22:00 Solo flute; 1 2 2 2 – 2 2 2 0; Timp. Perc. Pno. Hp. Str. 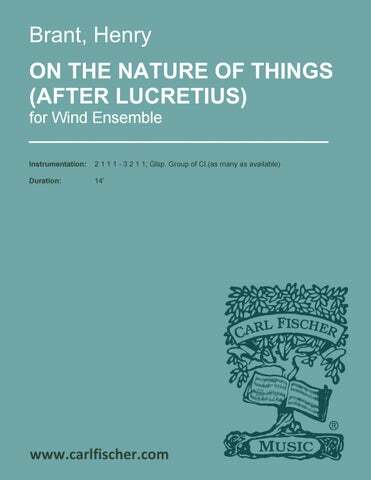 14:00 Solo flute, oboe, horn; Trio: fl., cl., bsn. (if no bsn. the trio may consist of glsp. plus unison of fl. and cl. [as many as possible] 3 fl. ; or 3 a. fl. ; or 3 tenor recorders); Quintet: tpt. (2), hn. (2), tbn. ; tba. ; perc. 20:00 Solo baritone voice; 3 3 3 3 – 4 3 3 1; Timp. 2Perc. Hp.(improv. Pno. obbligato) Str. 25:00 Orch. : 3 3 3 3 – 4 3 3 0; Timp. 2Perc. Pno. Str. Band: picc. (6), cl. (12), alto. Sax. (2), ten. Sax. (2); hn. (4), tpt. (6), flugelhn. (7), tbn. (6), bar.hn. (2), ten. tba. (2), bs. tba. (4);timp., perc. 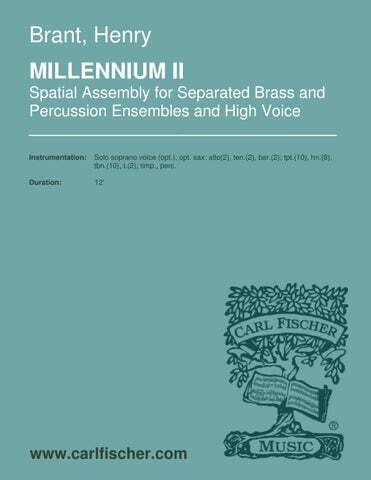 (5), handbells (3 chromatic octaves), pno., ce., hp. 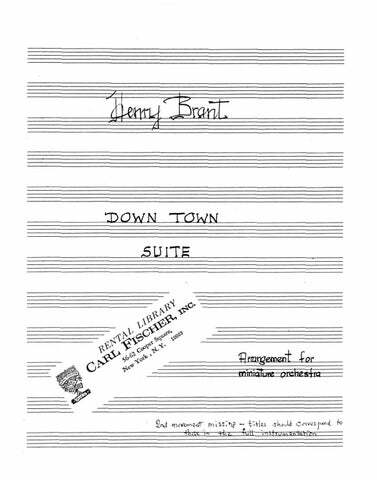 22:00 Solo women’s voice; organ obbligato; 6 3 6 3, 2Alto.Sax., Ten.Sax., B.Sax. – 8 6 6 3, Bar.Hn. ; Timp. 12Perc. Org, 2Hp. Str. 12:00 Solo soprano voice (opt. ); opt. 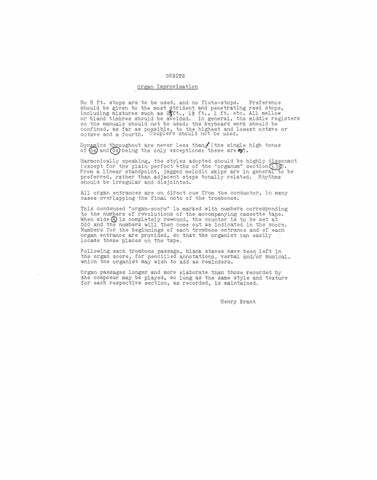 sax: alto(2), ten. (2), bar. (2); tpt. (10), hn. (8), tbn. (10), t.(2); timp., perc. 22:00 Solo coloratura soprano; Eb cl.(b.cl. ); Perc. Pno. vln., vla., vcl., cb. 3:00 Solo male declaiming voice (amp. ); tbn. (2); perc. (6), pno. 12:00 Solo mezzo-soprano, baritone voice; picc., fl. (2), ob. (2), (eng.hn. ), cl. (2) (b.cl. ), bsn. (2), (cbsn); pno., hp., timp., glsp. 15:00 Solo baritone voice; b. fl., b.cl. ; Timp. Perc. Pno. vla., vcl., cb. 30:00 Mezzo-Soprano; fl.(picc. ), cl. (Eb cl. and Bass Cl. 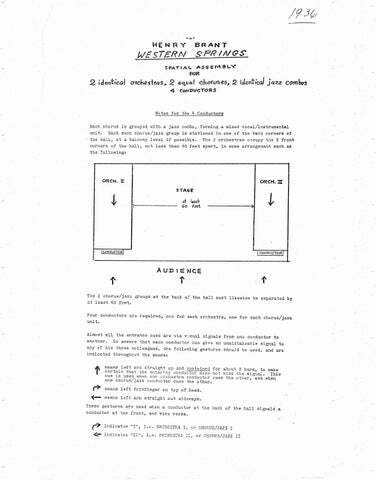 w/ extension), sop. sax.(bar. sax. ),; org., hp., mand., pno. ; perc. (2); vln., vla., vcl., cb. 23:00 Solo baritone voice; fl.(picc. ), cl.(b.cl. ); Timp. perc. pno. accordion (or org. or melodica) (opt. hp. ); vln., vla., vcl., cb. 7:00 Solo mezzo-soprano voice; fl., ob., ten. sax.(opt. ); perc. ; vln. 5:00 Solo flute (a. fl. ); vibr., pno., hp., org. (accordion); vln., vcl. 10:00 fl. (alto fl. ), pno. (or any 1: glsp., hpschd.,hp., org. ); vln., vcl. 21:00 Solo coloratura voice; tbn. (80 different parts); org. 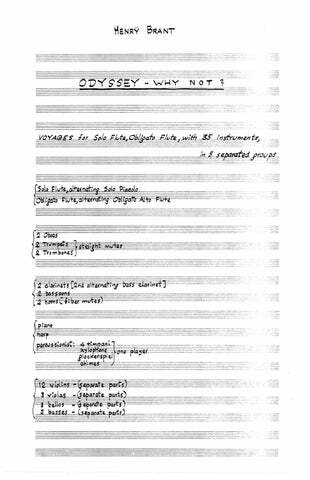 20:00 Solo soprano, alto, tenor, baritone voices; solo flutes (2); cl. ; tpt., tbn. ; perc. (10), 2 pnos., (hpschd. ), hp., accordion (2); vln., vla., vcl., cb. 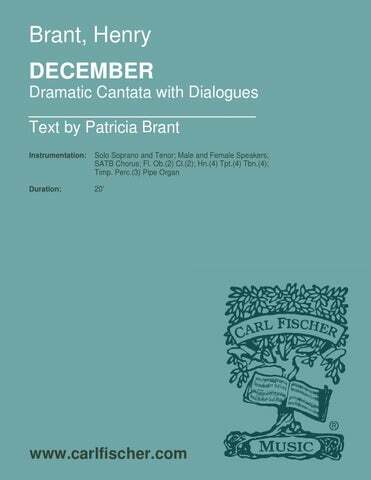 18:00 Solo soprano, mezzo-soprano, contralto, tenor, high baritone, low baritone voices; SATB chorus; tpt. (2), tbn. (2); jazz drumset, Perc. org. 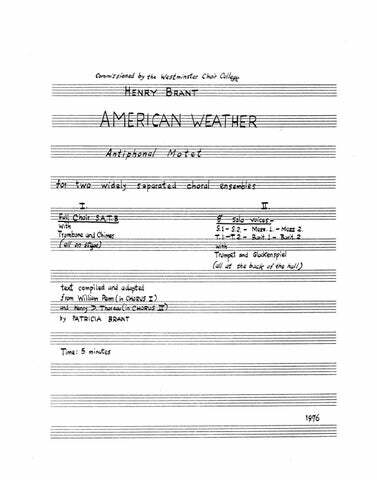 1:10:00 SATB chorus; fl. (4); tpt. (2), tbn. (2); perc. (4), hp. (2), pno., hand organs (or accordion) (2); org. 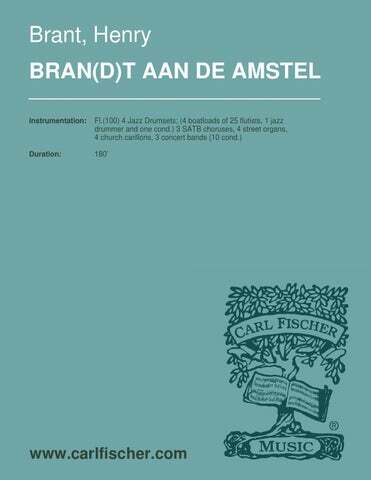 11:00 Solo Soprano, Alto, tenor, baritone; SATB chorus; tpt., tbn. ; perc. (2), pno., timp. 6:00 Chorus I: men/women; Chorus II: SATB; fl. (2), ob. (2), cl. (2), a.sax. (2); tpt. (2), tbn. (2); timp. (2), perc. (6), pno. (4), org. ; unison str. 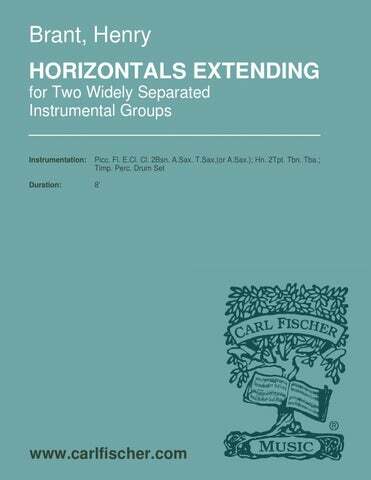 1:36:00 Solo coloratura, soprano, mezzo-soprano, tenor, baritone and bass voices; 2 SATB choruses (lg., sm. ); picc. (5)/3/13/b.cl./2/cbn./s.sax., a.sax. (2), t.sax. (2), b.sax. ; 4/4/4/bar.hn. (3)/3; timp. (2), perc. pno. (5), bagpipes; str. 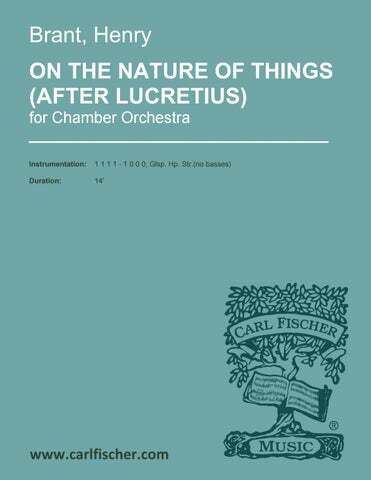 1:00:00 Solo coloratura, soprano, tenor, baritone, and bass voices; SATB chorus; Orchestra: 3 2 2 2- 4 3 3 1; 15Perc. Pno. (4 hands) Org. Str. ; flute choir (20+);Jazz ensemble: 2Sop.Sax., 2A.Sax. 2Ten.Sax. 1B.Sax. 6Tpt. 2Tbn. 2Perc. (arr.) 6:00 4 0 4 2 – 0 3 3 1, 2Bar. ; Timp. Pno. Str. (arr.) full score, fl., ob., cl., bsn., f. hn. (arr.) 2 2 2 2 – 2 2 3 0; Timp. Str.